Lezlee's Peppermint Highway makes traveling an adventure. Going places is a lot more fun with imaginative songs like "Sammy the Seatbelt", "When Are We Gonna Get There?" and "Peppermint Highway." If you enjoyed Lezlee's Lovabyes, you'll love this one. 22. When Are We Gonna Get There? Lezlee's Lovabyes Vol. 1 sang your children to sleep. 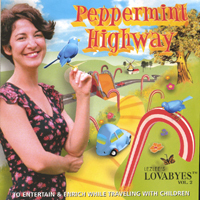 Peppermint Highway, Lezlee's Lovabyes Vol. 2, helps children and their parents enjoy traveling together. Traveling can be a happy, exciting, and sometimes scary adventure for children...and even adults too! Whether you're in a car, a bus, a train, plane, or boat - Peppermint Highway makes it a lot more fun! And it is educational as well. Lezlee is an internationally known singer/songwriter who has been featured in Women's World Magazine. Teaming up with co-writer and grandfather of seven, Mark Barkan, who has written hit songs for Nat King Cole, Lesley Gore, Dusty Springfield as well as the "Tra La La Song" for the Banana Splits and Producer/Arranger Joel Diamond, who has scored music for ballets, films and recently won the AFI award for his film score for "The Believer", together they have created Peppermint Highway. I love the CD. The songs are adorable and fun and her voice is great. My daughter and son listen to it every night when they go to sleep. They usually play it numerous times. We love it!!!!!!!!!! THANKS LEZLEE!!!!!!!!!!!!!!!!!!!!!!!! Sweetest voice and lyrics for your little ones! Lezlee' CDs are so sweet for presious little ones. I have bought several for baby gifts with two being sent to Brasil. Charm songs for the young and the young at heart. How often can you have songs from the new genre swim so wonderfully in your head for hours.